How do you place a freshly bought set of groceries in your refrigerator? Do you just slide items in and move them around to make more space when necessary, or cram in whatever fits, or stick things in the door or drawers indiscriminately? Well, you’re doing your food and drink a disservice! 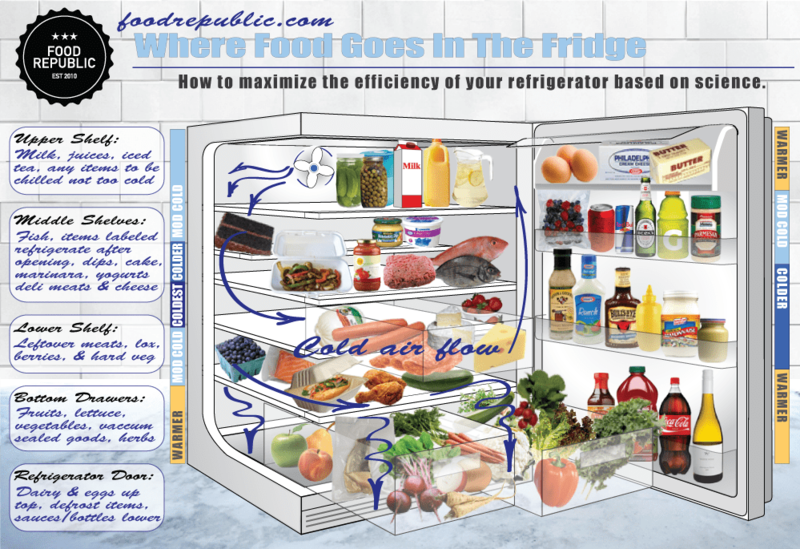 Learn where food goes in the fridge with this handy infographic (click here for larger image), based on the science of how most refrigerators are built. Print it out and use your favorite magnet to hang it up, and stop freezing your arugula and under-chilling your beer. Don’t overfill your fridge, which prevents cold air from circulating properly. On the other hand, don’t be proud of your half-empty fridge with its crusty ketchup bottle and six-pack of Coors; a desolate fridge is not only sad, but it invites uneven temperatures. Areas of the fridge that are not in direct contact with the cold air flow are warmer. Hence the lower part of a refrigerator is warmer, especially because it is shielded from the cold air flow by upper shelves and drawers. The door area in the fridge is warmer because it is further from the cold air source and because the other side of the door is in contact with the outside. However, compartments at the top of the door are cooler than those at the bottom because they are somewhat closer to the cold air source at the top of the refrigerator. An exception is the egg compartment, which is usually covered by a plastic cover that prevents circulation of the cold air. Opening the door of the fridge can let large quantities of warm air in. When opening the door, the cold air pours out from the lower part of the fridge and into the room and the warm air from the room is sucked into the top part of the fridge. Opening the door for 30 seconds can lead to temperature change of 5-10 degrees. It can then take up to 15 minutes for the fridge to return to its initial low temperature. Dairy products and drinks should be placed at the top of the refrigerator, cool but not too cold, so they do not freeze. Preferably, place milk and dairy products on the side where the cold air blows and position drinks on the other side. Meats and fish should be on the mid-tier shelf. Cheeses and cold cuts should be placed in the top drawer below the bottom shelf. Fruit and produce (salads and vegetables) can be in the middle of bottom drawer, still cool but not too cold so they do not freeze. One of these drawers usually has a humidity control. If there are two bottom drawers, the lowest drawer is best for food items that need some refrigeration but are under a vacuum seal and therefore will last longer. Eggs and butter should be placed in the door, but in a compartment protected by a cover so that they do not get too cold (eggs) or too hard (butter). Items that need the least refrigeration should be placed in the bottom of the door. Does Drinking Alcohol Repel Mosquitoes?